HondaJet's most recent update continues the company's good news on FAA certification, testing, and production. Financing is now also part of the HondaJet package. HondaJet is now very close to commercial operation in the United States. Presently, 6 HondaJets are in the production phase at the company’s North Carolina manufacturing facility. In addition, HondaJet is now moving to establish US-based leasing and financing through its own subsidiary for US customers. Our last update on HondaJet focused on its establishment of a service facility for the 498 MPH jets. That is now ready. We have also previously covered the flight testing milestones the company achieved. The photo with this story shows HondaJets in FAA supervised runway water ingestion testing. This test is a confirmation that the GE Honda HF120 turbofan jet engines can withstand extreme conditions. The company has now completed those trials as well as extreme weather testing. The first HondaJet with a production interior is now undergoing FAA cabin systems tests. 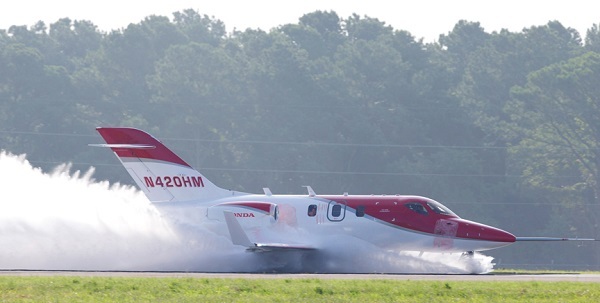 This particular HondaJet is the company’s fifth conforming aircraft and it will be on static display at an upcoming industry trade show in Henderson Nevada. Full-scale fatigue testing is also well underway. Presently, the testing has concluded the equivalent of a year of flight. The fatigue testing program will be completed prior to commercial operation. Production of the first six HondaJets is progressing as planned. Michimasa Fujino, president and CEO of Honda Aircraft Company commented on the progress, saying "The Honda Aircraft production team is diligently preparing to ramp-up production by continuing to implement lean manufacturing techniques and investing in workforce training. We anticipate our production workforce will double as we prepare for HondaJet entry into service." A recent press conference held by HondaJet focused on the company’s ability to offer loans and other financing. The Honda Aircraft Company and American Honda Finance Corporation (AHFC) has been established to offer this financing, making the HondaJet program quite similar to a Honda dealership experience for customers. The company will not only sell and service the jets, but will provide the financing that the customer requires directly. HondaJet was established in 2006. Designed to be the fastest, highest-flying, quietest, and most fuel efficient jet in its class, the HondaJet will enter service as the world’s most advanced plane of its type. No set timeline has been released for a first sale and first commercial flight, but with the current company updates one can assume that 2014 might be the year that HondaJet officially takes flight.